The Ship 'N Shore model is a state-of-the art charger for boats and RV's with deep-cycle batteries.Circuit-controlled fully automatic. Never worry about overcharging. Use it for onshore charging needs. Can also be switched to manual mode for special uses. For conventional 12 volt batteries. 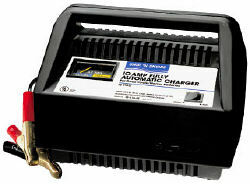 This product works well with: Autos, Light Trucks, Marine,Tractor & Farm Equipment, RV's and other 12 volt batteries. 10 1/8 X 6 3/8 X 7 5/8"